Scopes are vital to any birder venturing far beyond the garden or park, but there’s a balance to be struck between the extra reach provided by high-quality glass, and the need to carry such weighty optics around with you. With the Conquest Gavia, Zeiss look to have packed outstanding optics into a compact, easily portable package. The image is bright with no noticeable colour cast, and is sharp right to the edge of the impressive field of view. As you zoom in (from 30x up to 60x), you do get some milkiness at the edges, but not enough to be distracting. Colour-fringing was hard to find, except once when following moving birds against a bright light. Focusing is very precise, with the wide, helical focus wheel moving very smoothly and with moderately stiff resistance, taking exactly one anti-clockwise turn from close focus to infinity. The eyepiece locks in place. The rubber-covered eyecup twists up and down to three secure positions, and is comfortable in extended use, while build quality generally is superb – there’s lots of rubber armouring, a rotating collar that locks in eight positions, and a lens hood that operates very smoothly. The objective lens cover clicks into place, so shouldn’t go missing when you have the scope slung, and there’s a tethered eyepiece cover. The Gavia produces a very impressive image, even at high magnification, but just as impressive is its user-friendliness – I never got tired of carrying it around. At as little as half the cost of absolute top-end scopes, this is a piece of kit you really need to try for yourself. Each year at the Birdfair, when it was sunny, one of the Zeiss team would declare it ‘rubbish optics weather’. When the light is superb, even ‘rubbish’ optics make things look good. It is only when the weather is gloomy that you can separate the optical wheat from the chaff; the finest gear comes to the fore and the best optics bring out a level of clarity and detail that lesser equipment can only dream of. It was just as well, then, that when a group of journalists and dealers were invited to Poland to try out the Zeiss Conquest Gavia scope in spring 2016, that the weather was often poor! Birding in the gloom of drizzle in a Polish forest is a great test for any optical equipment. Of course, it helps you want to extract the very best from a telescope when the subject is a bedraggled Ural Owl or a hunting Pygmy Owl, or perhaps one of the several woodpecker species found in these magnificent woods. And it was here that the Gavia shone through, delivering excellent images with a speedy and accurate focus mechanism making forest birding a pleasure. It may not produce the mind-blowing views you get from a scope costing twice as much. But it comes very close and the whole point of the Conquest range is to produce optical excellence and usability at an affordable price. And in this, the Conquest Gavia really shines. 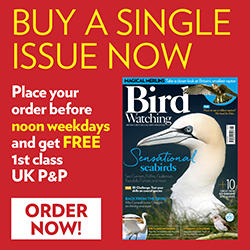 This scope review was first published in the January 2017 issue of Bird Watching magazine.